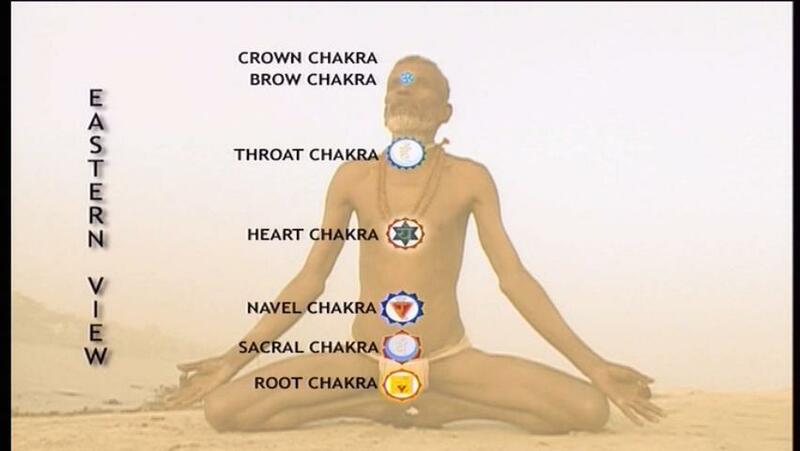 The word chakra literally means wheel. In ancient India chakra referred to the wheel of a chariot, a discus, the sun in the sky. Later in the Indian tradition, the word chakra came to refer to the wheels or circular vortexes of energy in the subtle human body. There are seven main chakras in the subtle human body. The first five energy centers are located along the spinal column (1) at the tailbone, (2) in the area of the sacral plexus between the hip bones, (3) in the area of the solar plexus behind the navel, (4) in the area behind the heart between the shoulder blades, and (5) at the base of the neck. The upper two chakras are (6) inside the forehead between the eyebrows and (7) at the crown of the head (see image). The chakras do not exist physically in the body. However, the energies of the chakras do affect all facets of the physical body. These energies also control the vital functions of our life force, our emotions, our thoughts and our higher mental and spiritual capacities. In other words, the chakras affect all aspects of the human condition. We live today as a sum total of all our past experiences. In a way, we live in a river of time. Our life at present has been determined by our past actions, and our actions today will affect our life in the future. We live downstream (present time) of those actions that have taken place upstream (in the past). All of these past experiences (causes) and the timetable for the resulting consequences (effects) are stored in our chakras. All of this stored ‘data’ in the chakras affects our current physical, emotional, mental and spiritual health. The ‘health’ of each of the chakras will determine our overall state of being and awareness. The goal is to bring the energies of the chakras into balance. By becoming more aware of the chakras, we can begin to open and clear old blockages and constrictions. We can heal old wounds. We can bring our life back into a state of harmony. For most of us, the chakras are out of balance. They are unhealthy. Their energies tend toward being either diminished or blocked, or are excessive and wasteful. Let’s take a look at some of the characteristics and psychological aspects of each of the chakras. Usually we start with the lowest chakra, and work our way up. The first chakra, located at the base of the spine, strongly influences the physical body. Past physical abuse, experiences of abandonment, major illness or surgery, can each seriously affect this chakra. We feel insecure, disconnected from the body, are sluggish, we can’t relax and be still, we have low vitality. A healthy first chakra grounds us, connecting us to the earth, providing us with a sense of security and stability. In doing so, it strengthens our immune system, giving us good health and optimal vitality. We are comfortable in our body, we become more prosperous. The second chakra influences our sense of movement and sensation, our ability to enjoy life and to change. How do we know if the second chakra is not functioning well? Past emotional and sexual abuse, overly strict parents and mentors, and poor nurturing are some of the events in our upbringing that can cause constrictions in this chakra. The effects can manifest as sexual repression/sexual addiction, denial of pleasure/pleasure addiction, rigid boundaries/poor boundaries and resistance to change (not being fluid…not going with the flow) are evidence that this chakra is out of balance. Balanced qualities would include an ability to experience pleasure (in healthy doses), able to nurture yourself and others, able to adopt easily to change. The third chakra generates the inner heat for transformation. This chakra controls our will, our energy level, our sense of self-esteem and power, our sense of purpose in life. Past traumas that can have a direct impact on the healthy functioning of this chakra are authoritarian and dominate parents and/or mentors, feeling shamed and belittled, growing up too fast. These past experiences can manifest today as low self-esteem, weak will, easily dominated by others, being passive, being unreliable, we have low energy, are overly competitive and arrogant. Healthy indicators are having a sense of confidence, a sense of self worth and of our own personal power; we have a warm personality, are playful and spontaneous, and are able to meet challenges. The fourth chakra is often referred to as the Heart Chakra. It gives us love and emotional balance. The Heart Chakra controls the physical and emotional heart, and through the lungs, it directs the vital flow of life force throughout the body. Past abuses that impact this chakra are unacknowledged and unresolved grief, emotional dominance of another, not being loved and being the recipient of conditional love, an experience of betrayal. This can result in depression, a sense of loneliness and feeling separate from others, fear of intimacy, being clingy and jealous, being an “emotional door mat.” A balanced Heart Chakra will bring a sense of peace, compassion, empathy, healthy emotional boundaries…and frequent experiences of boundless expansiveness. The fifth chakra controls our communication and self-expression. It is here that we learn to find our own voice. Past lies and living with secrets, not being allowed to express ourselves, being caught up with the opinions and judgments of others, can cause blockages in this chakra. We then have a fear of speaking, of speaking our own truth, we have a voice that cannot be heard by others, we have trouble hearing the truth when it comes from another, and we are either introverted and shy, or gossipy and talk too much. When this chakra is balanced, we become good listeners, our voice is resonant and others will listen to what we have to say, we communicate clearly and truthfully, we are more creative. The sixth chakra commands and controls all of the lower chakras. Its main faculty is perception. When we grow up not being able to make sense of the world around us, we become insensitive, we lack imagination, we become obsessive, have difficulty concentrating, we can’t ‘see’ life clearly and have difficulty planning for the future. When balanced, we have good perception and our overall perspective on life is good, we have a good memory and we can think symbolically. The seventh chakra is more difficult to define, since its realm of authority goes beyond our normal ability of understanding and perception. It is generally closed for most of us, and we have are not able to attune to the spiritual dimension of life. Forced and blind obedience to rigid religious views is a main cause a feeling cut off from supernormal spiritual perceptions. We then become spiritually cynical and apathetic, or we develop a spiritual addiction, afraid to question and expand our spiritual horizons. When this chakra does open up, we feel an interdependence and interconnectedness with all life. Our journey of inner healing continues. Of course, our chakras do not function independently of each other. There is a subtle interdependence that ties all the chakras together. Trauma will impact all chakras in ways that we are not conscious of. Healing needs to take place not just in one chakra, but throughout our whole energy eco-system.